Serendipity Winery is located along the Naramata Bench just north of Penticton. It is owned by Judy Kingston and her daughter Katie O’Kell, and vineyard manager Craig MacKenzie. The winery started in the fall of 2005 when Judy embarked on a wine tour of the Okanagan, which also was meant as a peek into retirement properties as well. 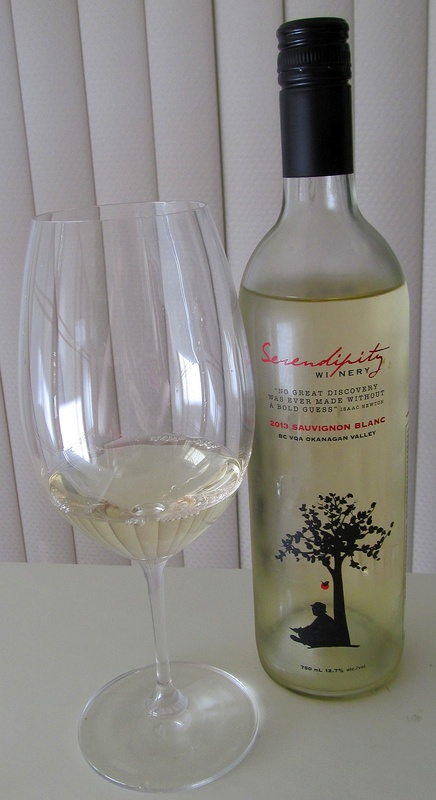 As serendipity would have it, she found a fruit orchard in Naramata which she purchased and began to convert it to a vineyard with a winery. In 2007 Judy planted eight acres of vines, with Syrah and Merlot as the primary reds and Viognier and Sauvignon Blanc as the whites. Subsequently she has added other varieties. The first harvest was in 2009; the rest is history, and hard work. 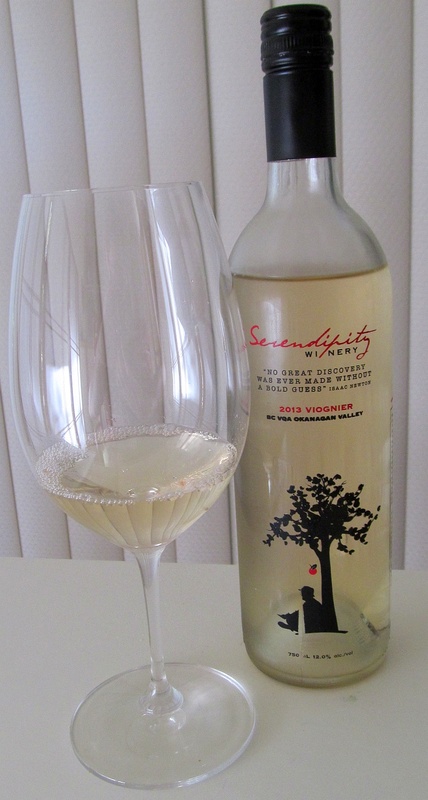 I have been lucky to receive four bottles of wines recently from Serendipity Winery to taste and review. As usual, I tasted the red wines immediately upon opening, and then again after some time decanting. My second tasting was after 5 hours of decanting. I hope you enjoy the notes, and if the wines sound tasty to you, consider purchasing some bottles from the winery. Let’s support our BC boutique wineries. Pale straw colour in the glass. It has a very pretty nose, showing stone fruit; primarily peaches and apricots, with some lime, perfume and yeast in the background. It is dry and round, with medium body that is quite mouth filling. You get a light acidic prickle on your tongue from the wine. On the palate, there is a very strong flavour of pine needle from me, followed by stone fruit, apricot, lime and a hint of pineapple. It has a medium length with a spicy finish. A fairly straight forward wine to drink now. Rating: A very pretty stone fruit nose, leading to mouth filling flavours of pine needles and stone fruit. This wine has bright pink grapefruit and other citrus fruit aromas in the glass. It is dry with medium plus acidity and body. More pink grapefruit on the palate, in combination with lime and a lesser amount of stone fruit, and some herbaceousness. I did note that this wine does has some minerality in the background, adding to it’s interest. Medium length with a nice mouthwatering finish. Another wine to enjoy now this summer. Rating Shows nice Sauvignon Blanc citrus character on the nose and palate, and added interest from its minerality. Although the blend of grapes is nowhere stated, I believe it is a Bordeaux blend with added Syrah. This wine was a medium garnet/purple in the glass, but what I liked most was it’s translucency from the core to the rim. Upon first opening the wine it had a vegetal character, but that went away with a few minutes of exposure to air. Upon my first sniff in the glass, I picked up black currants and cherries, other black fruits, and some sweet spice and meatiness. After decanting for 5 hours, the black currant aroma was joined with red currants. On the palate this wine is dry with a light mouth feel and a mineral backbone and fine tannins. Plums, black currants, black cherries, and a whiff of vanilla. Medium length with some pepperiness on the finish. 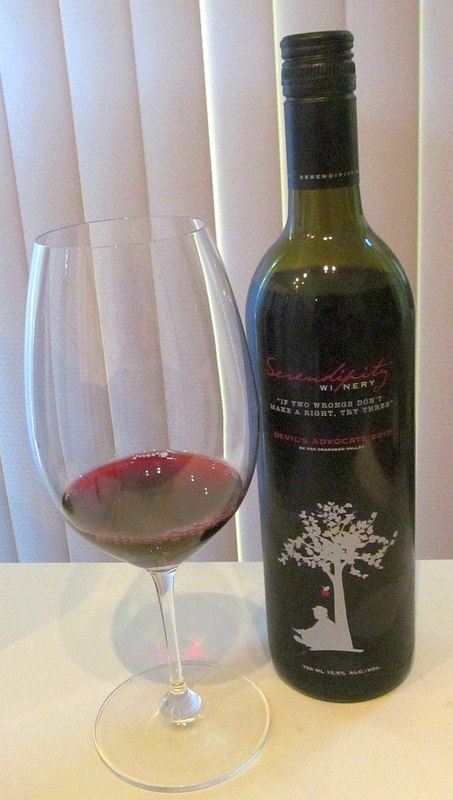 A nice lighter elegant red for you to enjoy. Rating: An elegant, lighter bodied red wine with good fruit aroma and flavour to enjoy. Another blend, but this one I do not have an idea of the blend. It was quite deeply coloured garnet in the glass. 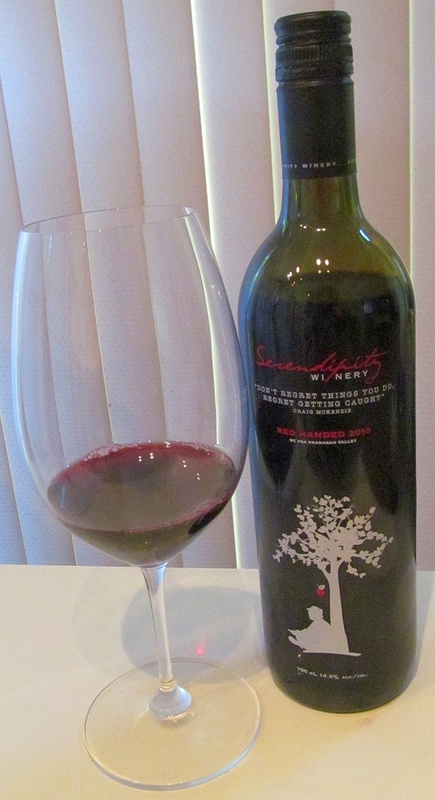 Aromas of ripe raspberries, sweet dark cherries, bruised apple, and some perfume. It is dry with medium acidity/tannins/alcohol/body. It was quite mouth filling and round in the mouth upon initial opening. After 5 hours of decanting, it became a little lighter feeling in the mouth. It had ripe raspberries, ripe black cherries, dried fruits and some vanilla on the palate with some chocolate near the end. Medium plus length, with a fairly tannic and puckering finish. With decanting the puckering finish was reduced. I think this wine might benefit with a year of aging. Rating: A bigger, more full-bodied wine with lots of ripe fruit. I did share these 2 red wines with a few friends that prefer red wines to get their feedback. Overall they liked Red Handed more, as it was more full-bodied and more fruity than the Devil’s Advocate. The latest news from Serendipity Winery is that they have a new wine maker, Mr. Bradley Cooper, who recently left from Township 7. I really am looking forward to see the style of wine with Bradley at the helm. Stay tuned for the spring 2015 release of their white wines! Where to Buy These Wines? You can purchase these wines through the www.serendipitywinery.com website. Great notes and I am glad to hear you like the wines. I have been enjoying the Red Handed lately.